Fruits can get their colors from a lot of places. New research suggests that the color preferences of the animals that eat fruit are among the strongest influences on fruit color. It's an assumption scientists have always made, but now they have some evidence to support it. It has long been thought that part of the reason so many fruits are red or black are because they're particularly attractive to the birds who eat those fruits, and later disperse the seeds after passing through their digestive systems. Plants and birds have come up with a nice arrangements over millions of years of evolution: birds get lots of nutrition from eating fruit, and the plants get to spread their seeds across the landscape as they get deposited in bird droppings. Birds have excellent color vision, so it stands to reason that fruits would have evolved colors that are particularly attractive to birds. While that makes a great deal of sense, it's always been what evolutionary biologists call a "just so story." It could well be true, but the evidence to support it is mixed at best. There are other reasons a fruit may have a given pigment, too, having nothing to do with attracting frugivores. Some pigments, for example, are simply effective fungicides. In addition, reds and blacks are particularly conspicuous in forested landscapes; those colors stand out against the background. So it may not be the birds prefer those colors, per se, only that they're more likely to spot them. Basically, the evolution of fruit color and of bird preferences are complex. To see whether there was any evidence that fruit coloration is at least in part guided by the color preferences of birds, Chinese Academy of Sciences researchers Qiong Duan, Eben Goodale, & Rui-chang Quan turned to four frugivorous birds from tropical Asia. They chose that region because it's got the largest diversity of frugivorous birds in the world, and those birds are critical to seed dispersal. In addition, few such studies have been conducted in the region, they say. And in the area, the overwhelming majority of fruits are, indeed, red and black. Of 412 "ripe fleshy-fruited plant species," 40% are black, and 19% are red. The remaining fruits are brown, yellow, multi-colored, and a few are green, white, or blue. The researchers were primarily concerned with whether the birds' color preferences were innate or learned. To find out, they compared the preferences of birds raised in a lab to those caught from the wild. The lab-raised birds were removed from their nests just a few days after hatching, so they wouldn't have had enough time to learn fruit preferences from their parents. Above: Northern Mockingbird. Matt McGillivray/Flickr. If there is a causal relationship between bird preferences and fruit color, then the lab-raised birds' preferences should reflect the fruit color frequencies found in their home forests. In order to distinguish the birds' preferences for the fruit's color from non-visible properties (such as taste or nutritional value) the researchers used both real, natural fruits, and artificial fruits. The faux fruit were concocted made from a mixture of apple, pear, banana, wheat, and corn flour, and were then dyed black, red, yellow, green or blue, matching the colors of the natural ripe fruits. When it came to real fruits, wild-caught displayed the same preference for both red and black fruits. None of the birds cared much for the yellow, green, or blue fruits, whether artificial or natural. When it came to the artificial fruits, red was the clear winner among the wild-caught birds. "The consistent preference of all wild-caught birds for red artificial fruit," say the researchers, "seems to support our hypothesis that birds prefer the most commonly encountered fruit colours, as blue, green and yellow are comparatively rare in the forest." Why was the black preference seen for the natural fruits not also seen for the black ones? That's puzzling, especially since the black fruits outnumber the red fruits in the forests from which the birds were taken. The researchers suspect that their choice of black dye was ineffective. It had a "reflectance peak" that may have actually led the birds to perceive it as blue. It's important to establish that the preferences of the wild-caught birds were in general consistent with the types of fruits available to them in the wild as a baseline. The critical information, though, comes from the human-raised birds, who didn't have any chance to learn about their environment. If they also preferred black and red fruits, then they had to be born with that preference. When it came to artificial fruits, they too preferred the red ones. Birds of many species are innately attracted to red objects, so this isn't entirely surprising. But when it came to the natural fruits, they actually preferred black to any of the other colors. In Xishuangbanna, the majority of ripe fruit are black (40%), and red are the next most common (19%). Therefore, the juveniles' unlearnt consistent preference for the black fleshy fruits of native species over the less common red fruit suggests that the frequency of natural fruit colour is better reflected by the innate preferences of these birds than by the preferences of wild-caught adults. Indeed, red fruits may be either ripe or unripe in nature, and therefore red flesh is not always a reliable signal of palatability. 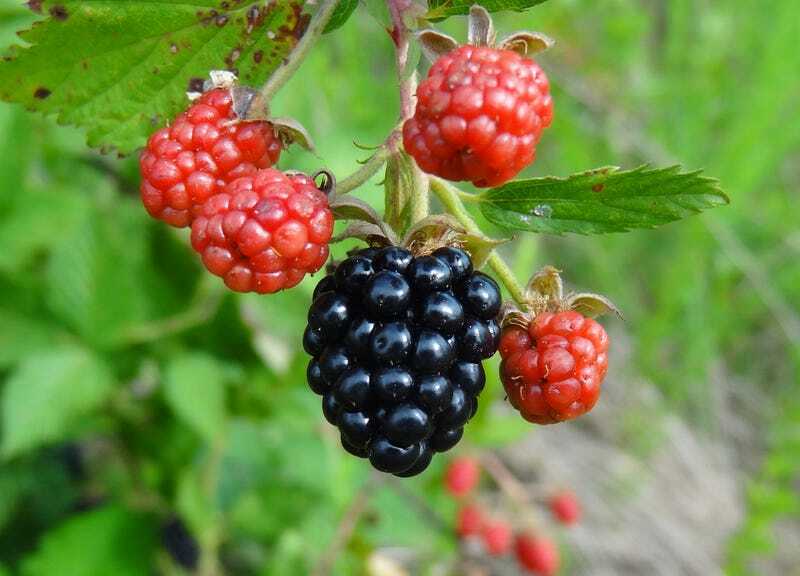 In contrast, the colour of natural black fruits always signals palatability and thus it would be adaptive for juveniles to prefer black fruit over red. Since the preferences were seen even for the artificial fruits, which were nutritionally identical, the researchers are comfortable concluding that the preferences were truly driven by the fruits' colors. Taken together, it appears as if the black preference is innate, while the red preference is the result of learning and experience. In fact, when the birds' preferences were analyzed over time, the researchers discovered that even the hand-raised birds eventually acquired a preference for red. Read the whole open-access paper at Scientific Reports.